Nathan Lafayette Lipscomb was descended from Thomas Lipscomb (born in Virginia in 1700). Thomas was a son, by some accounts, of a Joel Lipscomb, and by other accounts of Ambrose Lipscomb. For more on the “original immigrant” Lipscomb, read “Our first Lipscomb ancestor in America” discussion in Dorothy Garr Helmer’s book, Lipscomb: 300 Years in America, 1679-1979. The book is copyrighted and was used only to verify information that was previously researched by one or more of the individuals listed below. It contains information on the ancestors of Nathan L. Lipscomb and does not contain any information concerning our Nathan Lipscomb or his descendants. For the ancestral and descendant chart of Nathan Lipscomb and family according to our family's research and records, see the Family Tree submitted by Jan Sherrouse at Rootsweb. The father of Nathan Lipscomb, Elias Lipscomb, married Artemisa Golightly in South Carolina on February 14, 1840. They had eight children. Nathan Lafayette Lipscomb was the seventh child and fifth son, and was born April 24, 1855 in South Carolina. Two older brothers, William E. and John C. Lipscomb, died in the War Between the States. Another brother, Joseph F. “Joe” Lipscomb, served for a short time near the end of the War. Nathan was barely 10 years old when the War ended. Following the War Between the States (hereinafter called the “Civil War”to be politically correct) Elias moved his family to Bartow County, Georgia, and settled near Cassville. Contrary to Dorothy Hetmer's book and some Cherokee County Genealogical Society reports, Elias Lipscomb was not killed in the war. He lived in Bartow County until his death in 1896. (See newspaper obituary in the Courant American Newspaper.) His oldest living son, Joe, married Sallie Lowe (they had no children) and lived in Bartow County the remainder of his life (died in 1931). The next oldest living son, James Smith Lipscomb, married and lived in Bartow County for some years before moving to Texas. He died in Cooke County, Texas, in 1932. Nathan established the main branch of the Lipscomb family in Bartow County, Georgia. Nathan’s wife-to-be, Laura Lieuraney Crow, was born in Bartow County, Georgia, February 23, 1856. Her father, William Crow, had moved to the county (originally from South Carolina) between 1840 and 1850. He married Susan McEver (born February 25, 1826), the daughter of Brice M. and Lieuraney Boroughs McEver (married March 7, 1799). William Crow settled near some big springs in the central part of Bartow County north of Cassville and west of White, Georgia. The community became known as Crow Springs. Crow (or Crowe) Springs Baptist Church was established there in 1865. Sometime near the end of the Civil War, William Crow, a civilian, was taken prisoner by Union troops and died in a prisoner of war camp near Chattanooga, Tennessee according to official records. Laura’s younger brother, Lint Crow, born in 1862, took over the farming as a teenager and made a crop there every year until he died at the age of 86. The Crow home is still in existence (though not in the family), and is located at the intersection of what is now Spring Place Road and Crowe Springs Road in Bartow County. For more on the Crow (Crowe) family genealogy, see Jan's Family Tree (History of a Southern Family) at Rootsweb. Susan McEver’s family (Susan was the mother of Laura Crow Lipscomb) had settled near another large spring about two miles north of White, Georgia, on what is now Richards Road. Her two unmarried sisters, Margaret and Isabel or Isabella (“Ibby”) McEver, eventually inherited the McEver farm. They asked Nathan to take over their farm. Nathan and Laura moved there early in their marriage and lived there the rest of their lives. They inherited the farm when Aunt “Ibby” died in 1904. Both Margaret and Isabella McEver’s wills (along with their brother, Thomas C. McEver’s) are on file at the Bartow County Probate Office and on microfilm at Georgia Department of Archives and History. Jim Lipscomb’s wife, Lily Holden, and Cleve Holden, husband of Maggie Lipscomb, were sister and brother. Most of the spouses were natives of Bartow County, Georgia, and most of the couples remained in or eventually returned to the county. Most of the men were farmers and most of the women married farmers. Herschel was a foreman at the General Motors plant in Detroit, Michigan, before taking early retirement to return to the Lipscomb homeplace, which he had purchased. Cleve Holden was a skilled craftsman and operated a shoe repair shop at Etowah, Tennessee. The men and women were respected in their communities. Most of the farmers owned some, if not all, the land they farmed. Oscar was one of the first farmers in Bartow County (along with Harold Tribble), to breed purebred Jersey cattle. Rob, of all the brothers, developed the largest farming operation (cotton and beef cattle). The 48 members of the next generation represented a great diversity in occupations, with few depending entirely on farming for a livelihood, although a number of them owned and pursued some agricultural interests. Two of Nathan and Laura’s sons, Rob and Herschel, and a grandson-in-law, Tom Ramey, Jr., served in the Army during World War I. At least 25 of their grandchildren served in the military during World War II. Other descendants have served our country during various conflicts including the Korean, Vietnam, and Persian Gulf Wars. All of Nathan and Laura’s children are now deceased. There were 48 grandchildren, of which eight are still living as of July, 2007. Nathan and Laura were members of Wofford’s Cross Roads Baptist Church at White, Georgia, and are buried in the cemetery there. Many of their children also joined this church, providing important leadership and support. Many of them and their descendants are also buried at this cemetery. Other descendants, buried in Bartow County, are buried in White Cemetery, Cassville Cemetery, Oak Hill Cemetery (Cartersville City Cemetery), Sunset Memory Gardens (Cartersville) and Pine Log Cemetery. Still others are buried at other locations in Georgia, Alabama, Tennessee, Missouri, Arkansas, Texas, and Florida. 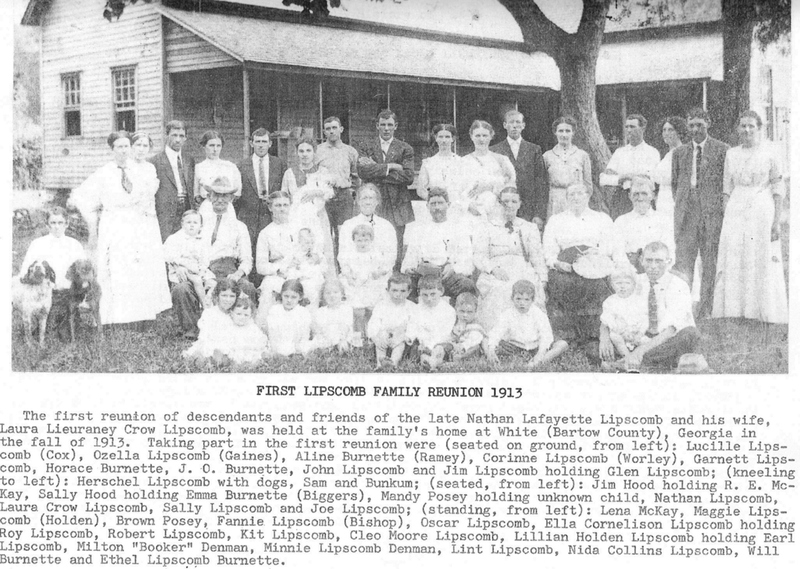 In the fall of 1913, the first Lipscomb family reunion was held at the Lipscomb homeplace, with all of their living children in attendance, as well as the spouses of those who were married and all of their young children, and several close friends and neighbors. Two photos of this reunion are still in existence. None of those who were at that reunion survive, with the death of the last grandchild who was in attendance, Emma Burnette Biggers, in January, 2006. The Lipscomb Family Reunion has become a yearly event, now meeting on the second Saturday in July, with attendance often exceeding 150 and including relatives traveling from many states. In 1976, when the nation was celebrating its bicentennial, attendees at the Lipscomb Reunion decided to prepare a time capsule to be opened by their descendants during the tricentennial in 2076. The capsule, containing family information, contemporary publications, currency, modern household devices, etc. was buried in the crawlspace under Wofford’s Cross Roads Baptist Church, Bartow County, Georgia. For more information and dates of the Lipscomb reunion, visit Lipscomb Reunion information. There have been and probably still are Lipscombs in Bartow County who are not descendants of Nathan and Laura or even of Elias and his second wife, Sarah Catherine Pratt. Some lived in the Stamp Creek community. These Lipscombs are probably descendants of Alberry Lipscomb, a distant cousin of Elias Lipscomb, and are from the same large Lipscomb clan who migrated from South Carolina.